If we’re in a slump, we need proper motivation to push past something difficult. Maybe it’s dragging yourself to work or doing that spring cleaning that should’ve been done two years ago. Whether it’s money or a sense of personal accomplishment you’re after, your desire for the end result has to be strong enough to keep pushing you towards reaching your goal. Of course, the best motivator for most is money, but curiosity will also give us enough of a boost to tackle challenges. If you are a fan of puzzles who wants to give a friend, family member, or loved one a challenge so they can share in your passion for the mind-boggling, then you’re going to need to give them a reason to try. 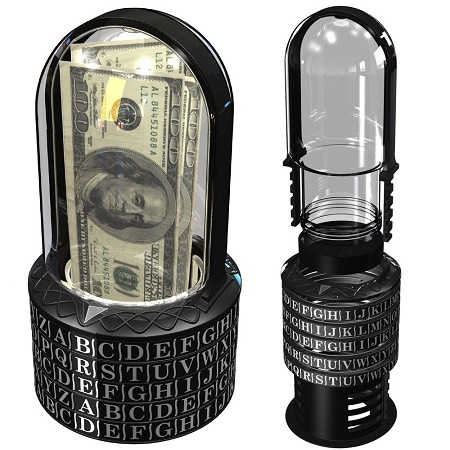 This Puzzle Pod Cryptex will let you store a prize of money, a toy, or a secret message in a see-through container and lock it away with a 5-letter word combination. This would be a great way to give money to younger family members who don’t care for cards or have lost the magic of getting a gift. It would be up to you to create the trail of clues and questions, but it would be a great way to test your skills as a riddle master. This will only cost you $29.95, and could make a regular gift more interesting, or make a normal day more intriguing.